If you thought Twitter was a fad or a nuisance, let me disavow you of that notion – it is a pretty useful tool for both business and pleasure and it’s here to stay. For one, I have had direct business solely from Tweets and found the most perfect iPhone app developer from a single Tweet – I think you will agree, that is a pretty useful use of a few seconds of my time. By osmosis, I’ve learned how to make Twitter work for me and how not to get addicted to it. You would think there’s not too much to it – it’s only 140 characters after all – how hard can that be? 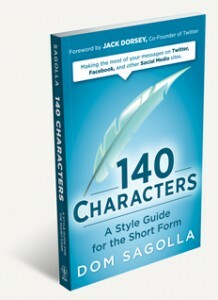 Well my world has just been turned upside down and exploded this week after I downloaded the iPhone app version of 140 Characters: a Style Guide for the Short Form by Dom Sagolla – one of Twitter’s progenitors. I was glued and read it in one sitting. Not only is the book one of the best manuals you will ever find for using Twitter properly but Dom is one erudite and intelligent chap. His understanding of human language, semantics and communication is outstanding. I so wish I will be able to write a book as intelligent as this one day. The iPhone app version of the book is pretty neat as it is embedded with rich hypertext to take you right to the resource, people and example tweets that Dom refers to. You can even interact with the content which incidentally is updated regularly too. The book is full of brilliant humour (or is that humor) too of how to and how not to Tweet. There are some real corkers and my Tweet stream might become a whole lot more interesting as a result of reading it. Dom is one Twitter expert who really does know his stuff – he was there from the ground up and user number #009. Once you read this book you will be able to spot the real gurus from the fakes, also rans and wannabees. His vocabulary is also amazing and I was reaching for my dictionary app more than once. If you still don’t want to read the book, here’s a quote from the book to summarise its essence. 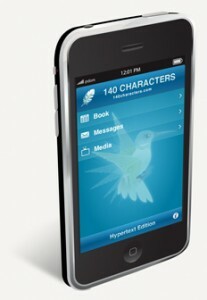 The book is a snip at only $4.99 for the iPhone but well worth the $12 or so if you want the print version. As a result of reading it, I for one am now not hanging about on my next book – it’s going to come out this year – in print and as an iPhone app in this form as I am inspired now more than ever to do fewer things even better ….